Kota Kinabalu is located in Sabah, Malaysia and is well known for the magnificent mountain Mt. Kinabalu. Climbing the mountain may be a bit expensive but staying in the city centre is surprisingly dirt cheap. Kota Kinabalu city is filled with good Malaysian cuisine that is affordable to most tourists' pocket. Plus, most attractions here can be pretty much covered by foot. Just grab a free map in the airport, at your hotel or from the tourism centre for easy navigation. Here are some cheap thrills you can indulge in Kota Kinabalu. The Heritage Village adjacent to the Sabah State Museum is a must-see when visiting Kota Kinabalu. 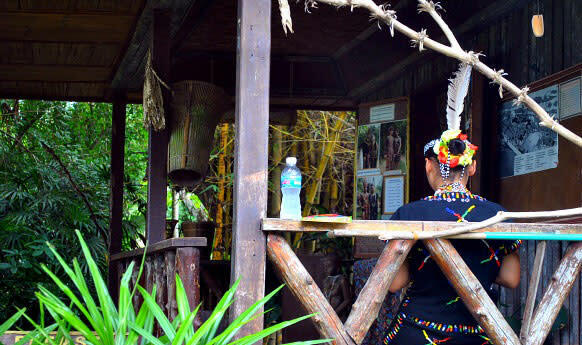 The entrance fee to the museum is RM1 only but visitors are free to roam around its lush jungle dotted with diverse traditional shacks replica of the houses of indigenous groups in Borneo. Cross a long hanging bridge to take you to the cultural village surrounded by trees and bamboos. Alternatively, if you are a little scared to use the hanging bridge, you can just follow the cemented path in the forest-like garden. 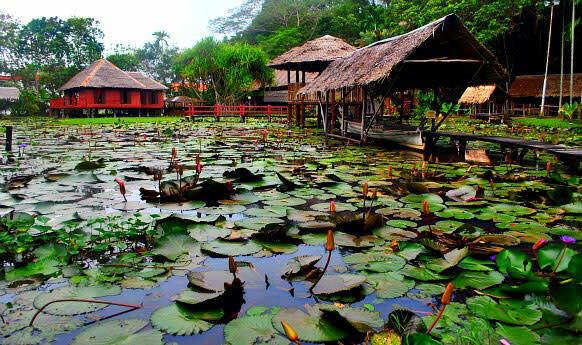 The houses that are mostly made out of nipa, woods and bamboos are set in a charming pond with lotus flowers. Inside the houses, visitors can try some traditional cook wares, obsolete fishing gears, old-fashioned farming equipment and music instruments. Sabah State Museum is open daily from 9 a.m. to 5 p.m.
A visit to Sabah would not be complete without a visit to the Monsopiad Cultural Village. 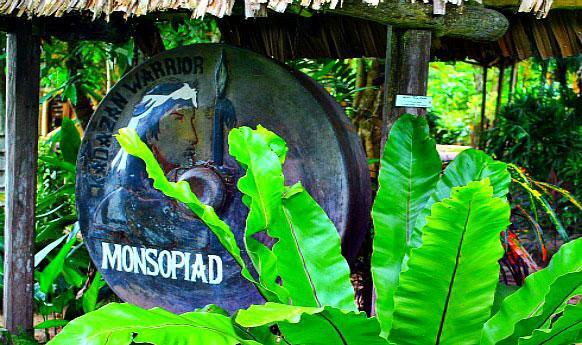 It is a living museum in Sabah set up in memory of Monsopiad, a warrior and head hunter of the Kadazandusun people who lived here some 300 years ago. This cultural village features Tangkob - a traditional rice barn, traditional games in Borneo, traditional apparatus for making rice wine, wood crafts, a hanging bridge, cultural shows and the legendary monolith surrounded by four bamboo poles where Monsopiad hang the newly cut heads of the tribal warriors. Fronting the museum is the "House of Skulls" where a collection of 42 skulls of tribal warriors are hanged with dried hisad palm leaves to protect them from uninvited evil spirits. Monsopiad Village is open daily from 9 a.m. to 5 p.m.; guided tours at 10 a.m., 12 p.m., 3 p.m. and 5 p.m., cultural dance at 11 a.m., 2 p.m., and 4 p.m. 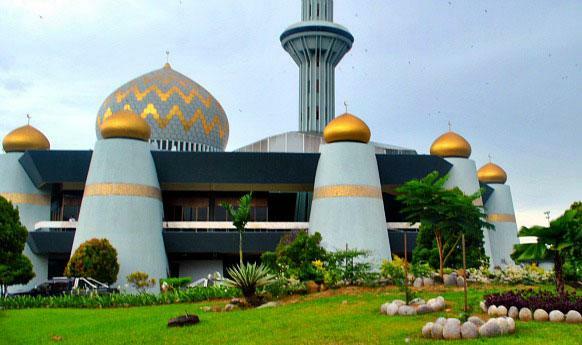 There are two remarkable mosques in Kota Kinabalu -- the Sabah State Mosque and the City Mosque. The Sabah State Mosque is an imposing mix of Islamic architecture and contemporary design and notable for its golden domes. Meanwhile, the City Mosque is the largest mosque in Kota Kinabalu located in Likas Bay. It is a charming floating mosque famous for its blue dome and a man-made lagoon surrounding it. Sabah Mosque is open from Monday to Thursday: From 8 a.m. to 11 a.m. & from 2 p.m. to 4.30 p.m., Friday: From 8 a.m. to 10.30 a.m. & from 2.30 p.m. to 4.30 p.m. Saturday & Sunday: From 8 a.m. to 11 a.m. & from 2 p.m. to 4 p.m. 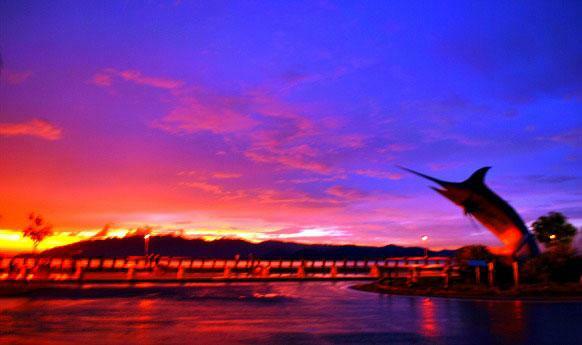 The City Mosque is open from 6:30 a.m. to 8 p.m.
Kota Kinabalu city is blessed with scenic sunset. The Waterfront is a good spot to catch the sunset and you can also check out the different dining and entertainment centre nearby. The best spot to view the sunset is at Tanjung Aru beach which is home to the sprawling Shangri-La Tanjung Aru Resort. Kota Kinabalu offers good and affordable South East Asian cuisines. The Night Market along the Waterfront is the best place to order Malay, Filipino, Indonesian, and Chinese food and a great way to enjoy a meal with the locals. There are fairly good restaurants around Gaya Street too, such as the Fook Yuen cafe and bakery introduced to me by the young Chinese tourists I met on my way to the beach. 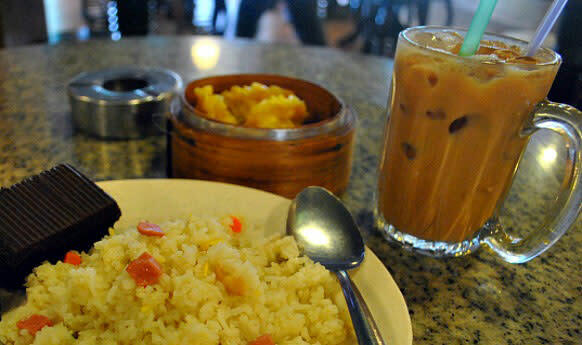 They offer delicious yet inexpensive Chinese dishes such as dim sum, noodles, kaya, and cakes and pastries. Strategically located along Jalan Tun Fuad Stephens beside the Central Market at the same stretch of the Waterfront is the Filipino Market and Handicrafts Market. The Filipino Night and Handicrafts Market is teeming with ornate wood carvings, exotic wooden masks, native handbags, wall panels, photo frames, pearl jewellry and accessories, trinkets, etc. This market is run by Filipino and Indonesian immigrants and is open from 7:30 a.m. to 7:30 p.m. daily. You can also check out the lively street market called Gaya Sunday Market. The entire street is closed on Sunday mornings for this grand street fair. Traders set up stalls here to sell all kinds of goods. Kota Kinabalu is blessed with powdery white sand beaches just along the coast of the city. Buy a ticket from Jesselton Port and you'll be taken by a speedboat to any of the five islands of Tunku Abdul Rahman Marine Park depending on what you paid for. 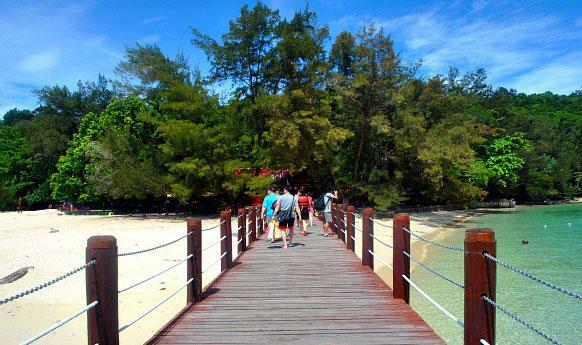 Tunku Abdul Rahman Marine Park consists of Gaya Island, Sapi Island, Manukan Island, Mamutik Island and Sulug Island. If you are to pick one island only, choose Sapi Island because it has the best beach quality. One thing I like about the beaches in Kota Kinabalu is despite its rise to fame, the wildlife here is still abundant. You can see horn bills, monitor lizards and macaques in the islands. Australia Place is named as such because this is where the Australian Liberation Soldiers (Australian soldiers) camped when they arrived in Jesselton (Kota Kinabalu's old name) in 1945. It's a quaint street bustling with original Chinese shop houses, the downtown police station and backpacker's hostel. Signal Hill Observatory is located around Australia Place. Take a few minutes' walk up the hill and you'll get a stunning view of the city. Do check out Atkinson's Clock Tower, a prominent landmark along Signal Hill Observatory which was built to commemorate Francis George Atkinson, the first district official of Jesselton (Kota Kinabalu). It is the oldest living structure in Sabah that survived the destruction of Jesselton town during World War II. Gaya Street is another interesting place for a leisurely walk. 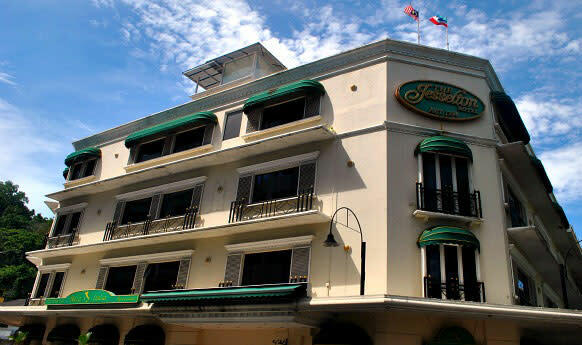 It is crowded with Chinese shop houses that serves as Chinese kedai kopi (local coffee shops), the Jesselton Hotel -- Kota Kinabalu's oldest and finest hotel, banks, legal offices and the belien-tiled Old Post Office which now houses the Sarawak Tourism Board. Continue walking down the road and you will end up close to Jesselton Port Jesselton Point Waterfront which serves as the ferry terminal for Labuan-bound passengers as well as the main boat terminal for Tunku Abdul Rahman Marine Park. Kota Kinabalu is not just about climbing Mt. Kinabalu. It is also home to many island beaches, mosques, cultural village, restaurants and cafes, flea markets, beautiful sunset and kind locals and friendly Filipinos that will make every tourist's travel experience worthwhile.